Secreat ninja powers I'm secretly a ninja, sush don't tell anyone! 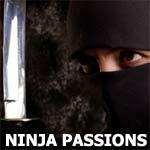 oak274274 is not a member of Ninja Passions. aren't ninjas supposed to be sneaky?